It’s late at night and you are exhausted after a -no mercy, endless- frustrating day… and you have to cook for dinner, for tomorrow, -it doesn’t really matter why- you have to put a meal on the table somehow. How many times you have experienced that….like a zillion? Your attention please, because recipe-rescue is on the way (one among others on my list). 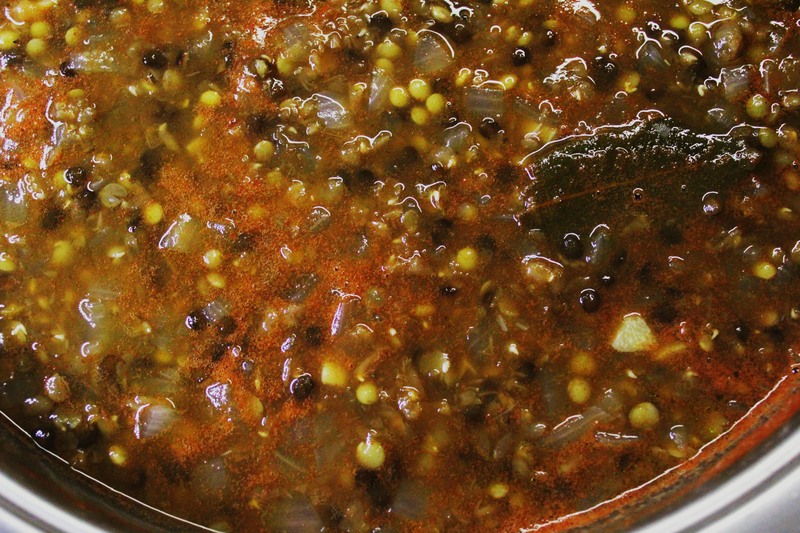 Lentils soup. Grab some onion, garlic, tomato, bay leaves….in the pot for 45 minutes and voilà !!! You can all benefit from that speedy, no fuss meal which is healthy and very filling. But the best part of all is that kids are crazy about it. I mean it!! It is on the weekly family menu and it can satisfy even the picky eaters or at least you will hear very few complaints. 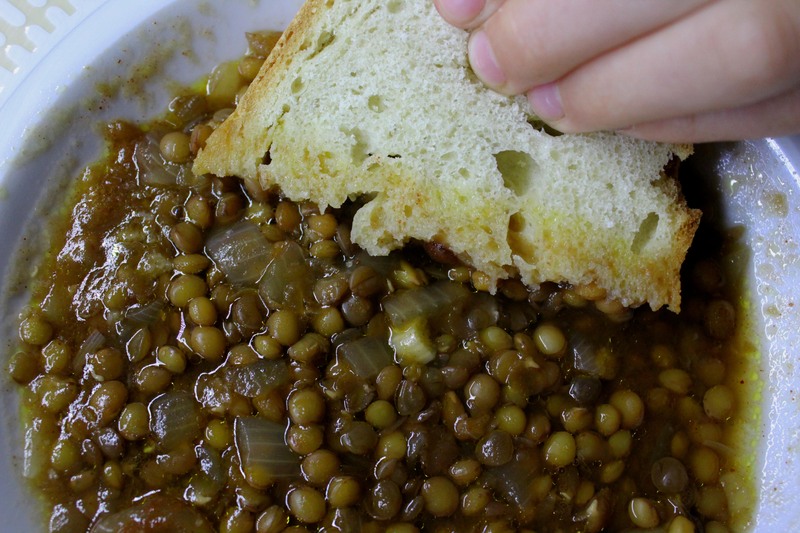 Lentils soup (fakes in Greek) is a staple of the Mediterranean diet. Don’t let the word “soup” to mislead you and put that recipe in the winter menu because we eat it all year long, even in hot summer days. You won’t easily find it at restaurants and taverns because it is mostly a home-cooked dish. There are of course different versions according to seasons and personal preferences but I advise you to taste the basic version and then add whatever you like, carrots, celery etc. I will get back to you shortly with many more recipes. For that one, I avoid the sautéing procedure and therefore we have an even healthier outcome which isn’t lacking in taste. And that’s a promise!! I add the quantity of oil I want at the end when the boiling procedure is over and there are no bubbles on the mixture’s surface. In that way the oil keeps its nutritional value, the soup is lighter and the flavor remains divine. Lentils are part of the legumes family and hold an important role in the Mediterranean diet. They are a high-fiber, protein and antioxidant food and nutritionally it is a great choice for those who like to combine health and taste. However, they contain phytic acid which is an antinutrient because it binds the minerals iron, zinc and small amount of calcium in the digestive tract. We don’t want this. Our body should absorb the maximum amount of all the good stuff we eat. Otherwise why to bother? Let’s order a pizza instead (not)!! How we could overcome phytic acid as an antinutrient and benefit from all the key components of legumes like proteins, antioxidants and fiber? Soak, sprout, ferment, heating! For the lentils I choose between two options: the fast way and the time consuming one. When lentils are on the weekly meal plan, I put the lentils in water for 8 hours and then sprout them for another 12 hours. This is the best way to ensure the absorption of minerals and proteins. When lentils are a last minute decision, I just boil them for 2-3 minutes and dump the water. I admit that this is not the ideal way to overcome phytic acid, plus heat is possible to destroy phytase and vitamin C. My advice is to choose soaking and sprouting as this procedure neutralizes the inhibitors. Α tip that will trigger taste and senses: at table, just before you eat, add red wine vinegar in your plate and you will enhance mineral absorption, offset phytic acid and succeed an intriguing taste. No more than a tablespoon (or less if it is not your favorable taste). Finally, some good news and bad news. Good news: iron from plant sources is absorbed in small amount and we could enhance the absorption with tomato which contains vitamin C. So, combine tomato or other vitamin C source with lentils. For example, drink fresh orange juice with your meal or eat salad, vegetables served with lemon. Bad news: no feta with lentils, guys!! Sorry!! I know feta is delicious and goes with almost everything but … legumes. Dairy contains calcium that seems to hinder iron and zinc absorption. To tell you the truth, I cannot always help it and I sometimes commit the sin of eating some creamy feta with my lentils. Feta sinner you may call me. I love that dish especially when it is served with grilled bread and Kalamata olives…. Enjoy! STEP - If you have time soak and sprout. If not, put the lentils in a large pot and cover them with water. Boil for 2-3 minutes, rinse and drain. Clean the pot, put 6 cups of water (or vegetable stock) over medium heat. STEP - Put lentils, chopped onion and garlic, bay leaves and cover the pot for 30 minutes. Taste the lentils. If they are soft, add the passata or tomato. If not, add 1 cup or 2 cups of water (or vegetable stock) for another 15 minutes and then add tomato. Adjust the amount of water/vegetable stock whether you like watery soup or thick soup. 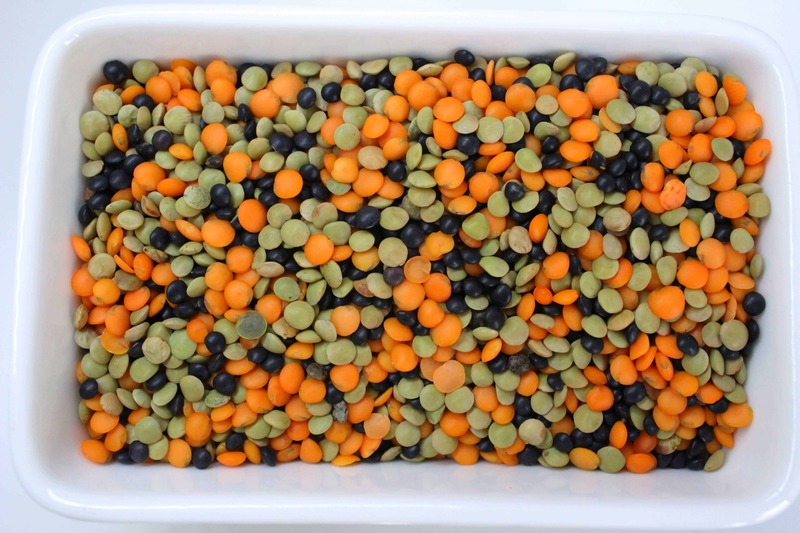 STEP - When lentils are soft and pleasantly chewy, add the salt, wait for another 2-3 minutes and remove from the heat. Add olive oil.